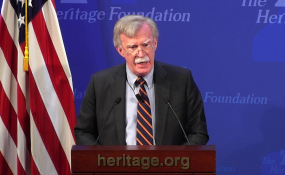 John Bolton discusses the Trump administration's Africa strategy. are rapidly expanding their financial and political influence across Africa... to gain a competitive advantage over the United States. Bolton's portrayal of great power competition sounded like the Cold War era when the US and the communist powers, led by the Soviet Union, fought for influence over the new states emerging from colonialism across sub Saharan Africa. At the end of the Cold War, the US withdrew almost completely from Africa. In the 1990s, Washington distanced itself from an area of the world in which it no longer saw any vital interests. But in the 21st century there has been a significant turnaround in US policy. What's emerged is a return to seeing sub-Saharan Africa as a site of US geopolitical and commercial interests. This reversal is based on three factors. The first is the increasing significance of new African oil supplies. The second is the alleged presence of terrorists in the "large uncontrolled, ungoverned areas" of sub-Saharan Africa. And the third is the emergence of middle class African consumers as a potential new market for US exports. Under George W. Bush, the US recognised that African oil from the Gulf of Guinea had become an "important factor in determining conditions in the oil market." a number of frontier oil provinces that may become hot exploration areas during the coming decade. These included São Tomé and Principe, Gambia, Liberia, Togo, Benin and Niger. better hosts to the very large investments needed to develop energy resources and make more reliable contributions to our own energy security. a lot of this new oil is actually offshore. There is no one to protect it, unless we build up African coastal fleets. This led to the launch of the US Navy's Africa Partnership Station in 2007 to help Gulf of Guinea states secure the region from security threats at sea. The focus on energy security continued through the Obama years. The Obama administration established Operation Obangame Express, and the African Maritime Law Enforcement Partnership to train Gulf of Guinea nations to protect offshore energy. Both have been continued under the Trump administration. The terrorist attacks on the US in September 2001 resulted in a new counter-terrorism dimension to US security strategy in sub-Saharan Africa. The region began to be viewed as part of an "arc of instability" stretching from Latin America, through Africa and the Middle East and extending through Asia. Its "ungoverned space and under-governed territories" might provide "sanctuary to terrorists." To prevent this, the Bush and Obama administrations established a series of programmes designed to strengthen border security and build internal security. A number of initiatives were launched in a bid to build security capacity in African states thought, by Washington, to be vulnerable to penetration by terrorists. These included (to name but a few), the Combined Joint Task Force-Horn of Africa (2002-present), the Partnership for Regional East African Counterterrorism (2009-present) and the Counter-terrorism Partnerships Funding (2014-present). The expanding US military presence in Africa was symbolised by the establishment in 2007 of a new US military command structure, Africa Command(AFRICOM). It took charge of all US military activity on the continent, including the bombing of Somalia. who were "increasingly demanding high quality US products." One result was a law passed in 2012 that sought to increase American Jobs through greater exports to Africa. Commercial opportunities in Africa were also at the heart of the first ever US-Africa Leaders Summit in 2014. This saw the launch of the Doing Business in Africa campaign. The Trump administration's expansion of the bombing of Somalia, its continuation of Bush and Obama era counterterrorism programmes, and its own new strategy for Africa suggest that policymakers continue to view the continent through a geopolitical lens. The particular twist put on this by Trump is his emphasis on the competition the US faces from China - but this is hard to imagine given that China has just one military base in Africa. But the Trump administration must learn from mistakes made in the recent past by Bush and Obama. This includes the negative impact US action has had in some instances. Take its support for the Ethiopian invasion of Somalia in 2006 and for the subsequent Ethiopian-led occupation force. These actions contributed to the development of Al Shabaab, the extreme Islamist group that merged with Al Qaeda in 2012 and began to conduct attacks in other countries. Al Qaeda is now a more sophisticated and dangerous organization in Africa... [It]s foothold in Somalia has probably been facilitated by the involvement of Western powers and their allies. It is likely that US air strikes in Somalia "have only increased popular support for Al-Shabaab." More broadly, Washington's internal security and capacity building initiatives have not worked. If anything, terrorism in Africa has worsened with the emergence of Al-Qaeda in the Islamic Maghreb in Mali and Boko Haram in Nigeria. US policymakers need to think again about whether a security agenda based on US priorities and choices will always solve the problems sub-Saharan African states face.